The NT105-A now with soft foam grip · New T245-GA with reinforced cable. 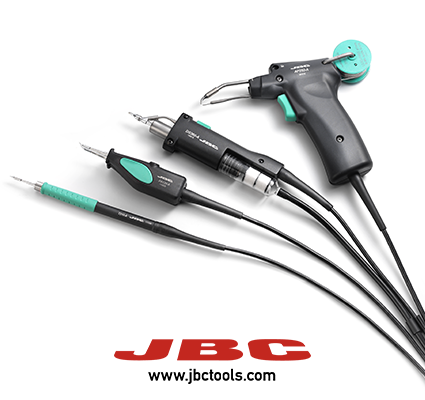 JBC has improved once again its soldering irons thanks to customer feedback. The NT105-A Nano Handle now features a soft foam grip which ensures better handling and improves user comfort. This improvement makes the NT105-A the ideal tool for soldering the smallest passive components used nowadays in the electronics industry (e.g., 008004). Moreover, the company has released a new model: the T245-GA General Purpose Handle. It works with JBC widest range of cartridges, C245, and it features a reinforced cable suitable for high power demanding applications and intensive use. This reinforcement provides improved resistance to mechanical wear generated by torsion, compression or stretching forces on the cable during the use of the tool.